In Salt Dreams, Bill DeBuys writes, “In low places consequences collect.” Southern California’s Salton Sea collects and manifests the hydrologic consequences of intensive agriculture in the Colorado River basin, the leaching of salts and selenium from ancient sea-beds now elevated high in the Colorado Plateau, as well as the fertilizers and pesticides running off of the fields in the Imperial, Coachella, and Mexicali valleys. The Sea also reflects the consequences of political and economic decisions and deals in the basin and in Southern California. By 2018, the Salton Sea will begin to reflect the consequences of the nation’s largest agriculture-to-urban water transfer, a long-term deal that has helped San Diego and the urban coast survive California’s persistent drought but that will soon cause the Sea’s surface to drop by 20 feet and its salinity to triple. 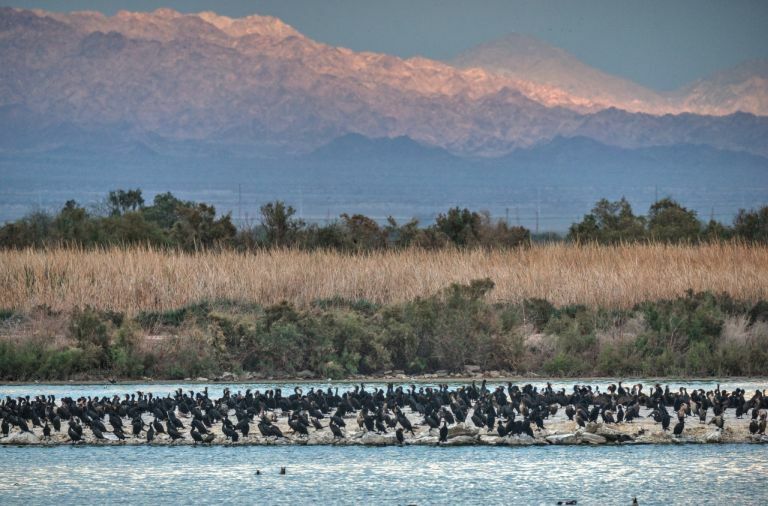 The shrinking Salton Sea poses several significant threats, including the loss of habitat for more than 420 species of birds – often numbering in the thousands of individuals – and of the ecosystem as a whole due to rapidly rising salinity. The shrinking Sea will also expose tens of thousands of acres of dust-emitting lakebed in a region where air quality regularly fails to meet state and federal standards, posing a direct and measurable threat to the hundreds of thousands of people who live downwind from the Sea. The loss of the ecosystem and the escalating public health costs driven by poor air quality, combined with massive fish and bird die-offs and associated impacts on local and regional property values, could cost the region tens of billions of dollars over the next 30 years. As noted in a recent article in the Desert Sun, insufficient state action and the lack of a long-term commitment to the Salton Sea impede efforts to address the long-term supply-demand imbalance on the Colorado River, potentially jeopardizing a vitally important multi-state deal. The consequences of failing to act on behalf of the Salton Sea could, in fact, extend well beyond the Sea and the surrounding region. 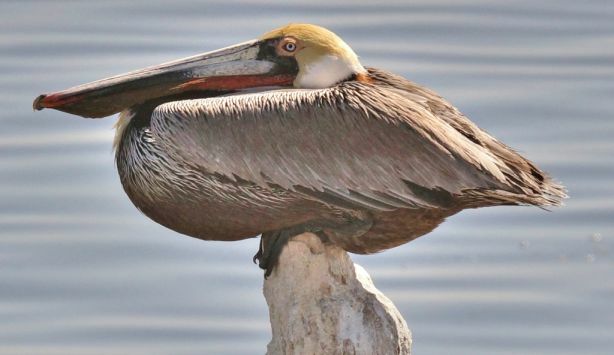 Last October, California recognized its responsibility to protect the Salton Sea and set admirable short-term habitat and dust suppression goals. The governor’s budget for the next fiscal year contains $80 million for Salton Sea projects over the next three years, a small fraction of the total investment needed but an excellent start. 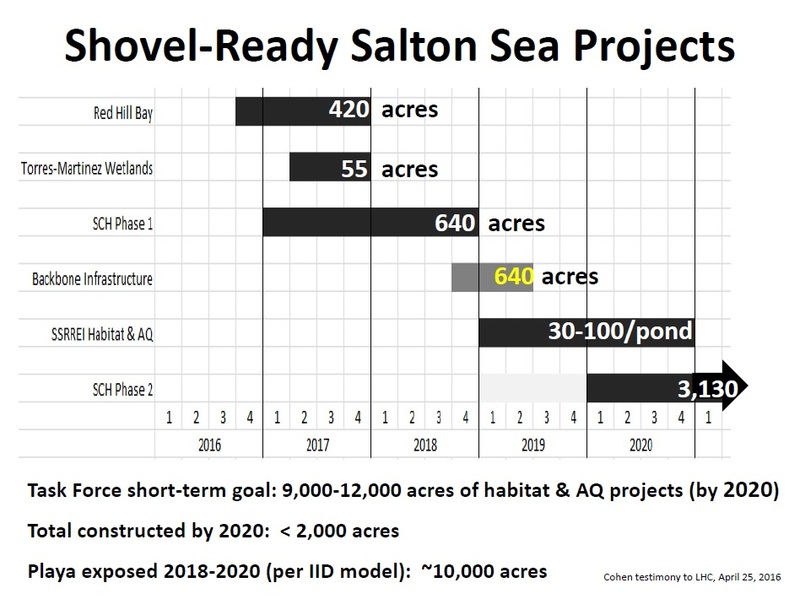 And a recent report to the legislature detailed several “shovel-ready” habitat projects at the Salton Sea. 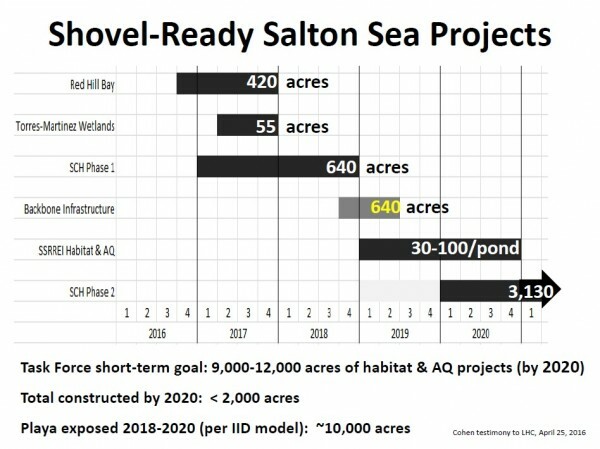 Yet, as shown in the figure below, the proposed habitat projects wouldn’t even keep pace with the amount of lakebed exposed in the next several years. In collaboration with other organizations, the Institute has recommended several specific actions to accelerate the state’s implementation of habitat and dust suppression projects at the Salton Sea. We are very concerned that the excitement generated and promise offered last October by the state’s hiring of a new Assistant Secretary of Salton Sea Policy and the establishment of aggressive acreage goals for habitat and dust suppression projects at the Salton Sea will not translate into actual projects or progress on the ground. California’s continuing focus and dedication of high-level staff to the challenges of the Bay-Delta come at the direct cost of attention to and progress at the Salton Sea. Yet the Salton Sea offers real potential for significant success, with broad consensus among stakeholders over the nature and timing of short-term projects, ample water, and demonstrated results. As we make clear in our recommendations, the challenge is to operationalize the state’s commitment, to dedicate resources, and especially the right set of skills to manage the projects already identified, funded, and permitted. Unlike the challenges of protecting habitat and human health in most of the water-starved West, this problem is not a lack of water but rather a lack of political will. With the $80 million in the governor’s budget and a dedicated effort from state staff and local stakeholders, we could celebrate the completion of more than a thousand acres of high-quality, dust-suppressing habitat projects by the end of next year. This short-term success is within reach, but it will require dedicated project management, urgency, and commitment.